This album is the soundtrack of my love affair with music, with the guitar. Delivery half century, passion and devotion fortunate to live my dream since I have memories. The dream of being a musician and live, for and this. When I was a child of six years, my uncle Jose Maria came home one morning with a guitar Reyes containing another gift in its case: the score of the Concierto de Aranjuez by Joaquin Rodrigo. My uncle, Andalusian race and lost his head by the Spanish Guitar said: "Boy, to see if dinner has "sacao" Some of this is pretty mu ". Causalities of life. I want to believe (Y, in fact, every day I think more) an intuition guided from the top took my uncle to give me that guitar and that score that, half a century later no longer have free blank to target the names of so many theaters of the world where I have been playing. thanks tito. When my mother, Carmela, he realized my passion for guitar, I found a teacher who came home to teach me. He found and sought not say that this story is guided by inspiration. that teacher, Mr. Cabrera, She was a flamenco guitarist. Mom, so, I did not know styles or slogans. I never thank enough my first steps were given through that wonderful and magical music that is the Flamenco. Thanks Mom. A year later, on the recommendation of this teacher, I was blessed by what I consider my great Master, Dona America Martinez, essential figure in my life and in my career. Teacher who not only taught me everything about the guitar, but it formed me, from the beginning to be a concert pianist. From my first concert with eight years, I always encouraged that whatever happened in my life out on stage with a smile on his face. Thanks Doña America. My father always told me I was a lucky person in life. He was right. How fortunate to have shared the stage, essays, dressing rooms and travel with names like Teresa Berganza, Placido Domingo, Paco de Lucía, Mistlav Rostropovich, Elton John, and many illustrious names that I apologize for not being able to list in a text that I will not be long. Dad thank you and thank all you have done for me this musician who continues to devote his life to this wonderful form of expression of the soul. There's a name, Finally, which I do not want to do without, my brother, maestro, Soul friend, Felix Grande was the first composer saw in me in which I became. I did become aware of this aspect and encouraged me to be the interpreter of my own work. thanks Felix, without you this record would not be where it is. What Nietzsche said: "Without music, life would be a mistake". 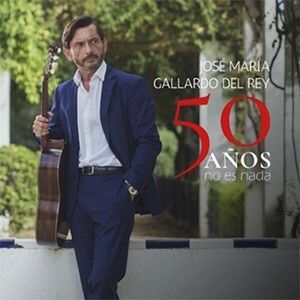 José María Gallardo, He debuted in Seville, your natal city, at the age of nine and has since managed to reap the greatest hits from critics and audiences on stages around the world. His extensive training as a musician he has allowed to develop facets of composer and conductor. He has directed, among other, the Chamber Orchestra of Oasaka Telleman the debut of Paco de Lucia Concierto de Aranjuez, (Japan, Mayo 1990). He was the author and performer of High Definition from Spain, official film of the Spain Pavilion at EXPO 92. He is founder and musical director of chamber ensemble La Maestranza, septet with which he plays his own music. He was invited to perform in Paris with Menuhin, Rampal, Ozawa y Elton John, gala 70 Rostropovich anniversary in March 1997. John Williams appears in the most prestigious International Guitar Festival in Australia (Darwin, 1995 Y 1997). Coinciding with the centenary of the master Rodrigo, He reinterpreted his concertos for guitar and orchestra worldwide. It is usually applied to hold solo recitals and with orchestras to act throughout Asia. and also in Australia, where the world premiere of works by Sainsbury was held and G. Brophy, written for Gallardo del Rey. In Europe they highlight his concerts with the Royal Philharmonic Orchestra in London, the concert in Brussels for the signing of the Treaty of Rome, performances at the Theater of the Champs Elysee, Paris Opera Comique, as well as the Concert and Opera House Stockholm, Dublin National Auditorium, Konzerthaus de One, Stravinski Auditorium Montreaux, Performance Arts Center in California or Carnegie Hall in New York. In Spain it is common to find at the Auditorio Nacional de Madrid, Monumental theater, Teatro Real, Teatro de la Maestranza and Teatro de la Zarzuela. He was the guitarist chosen by the late composer Fernando Arbex for creating the cadences of Toledo Concert, recorded in London with the London Philharmonic Orchestra. Su disco The Trees Speak, It was published by Deutsche Grammophon. During 2006 They published by the record Mandala two double albums, "The Spanish Guitar" and "Voyage au pays de la guitarre". And during that same year, he released his second CD on Deutsche Grammophon, by the flautist Ezequiel Cortabarría, qualified “14 Ways to miss you”, with music by Astor Piazzolola. During 2008 He collaborated in the recording Spanish Passion with Placido Domingo and the Community of Madrid Orchestra. In 2013 It is published Gallardo Del Rey: glosses – Russell: Romantic concert also with Deutsche Grammophon, and the following year published next quartet Channels: Diego Araciel: Chamber works for strings (Hispanic Musical Heritage 32).